Dear Friends and Readers, I have a lovely quilt block idea to share with you today! An old classic made fast! I think you will love it! I’ll share with you all my thoughts. I need to come up with a baby quilt really quickly. The baby is due soon. I don’t know if it will be a boy or a girl. No problemo! Scrappy covers everyone! I have always loved Courthouse Steps quilts. I have seen a couple of antique beauties where each of the diamonds which are formed by the pattern are in a different colour/fabric. Stunning! However, I can assure you that this takes considerable planning as each one needs to link into the next adjacent block and the one below in the next row. You would need a design wall or a space to lay out your quilt blocks every time! A bit tricky! Hence today’s idea, take away all that stress, and just make some blocks. Instead of defined fabrics it will be scrappy and we will only have to worry about light and dark! Simples! To make it even faster, the rounds will be graduated in size and there will be fewer of them, so it should come together quickly and easily with the ability to use all those oddments. Not only that, because there are fewer rounds, there is less chance of the blocks bowing, which traditionally can be a problem with log cabin and courthouse steps blocks. Make as few or as many as you like! 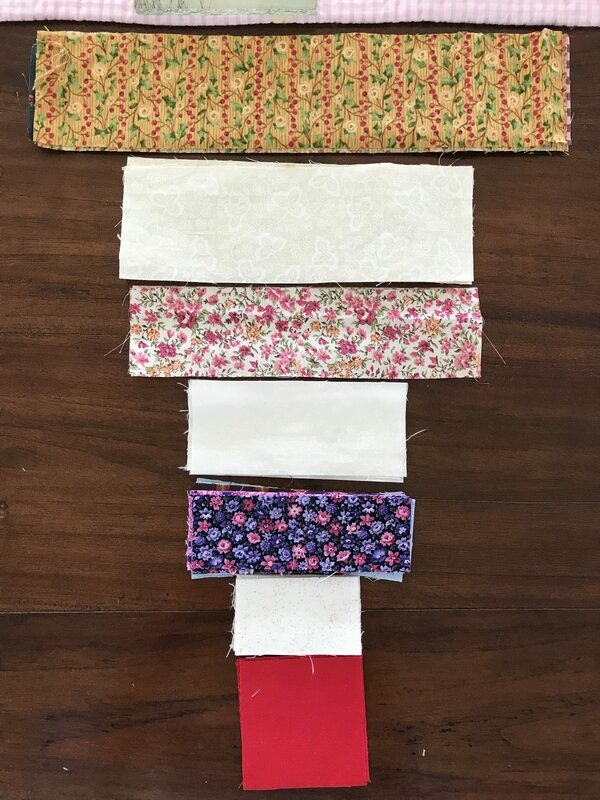 I was lucky enough to be bequeathed some lovely scrap strips from my friend Wendy, so some of them will be in his quilt. Thank you Wendy! Incidentally, traditionally these blocks had a red or yellow centre square to signify the hearth of the home or a window. You can follow this tradition, or choose a colour you like or even make them all scrappy. It’s up to you. I think you will see this has a lot of scope. As I was writing this post I also thought it would make an awesome man’s quilt with the centres in navy and a navy binding. It would be beautiful in shirtings or plaids. Just a thought. The blocks will be 11 1/2″ x 11 1/2″. As always all my fabrics have been washed before commencing. 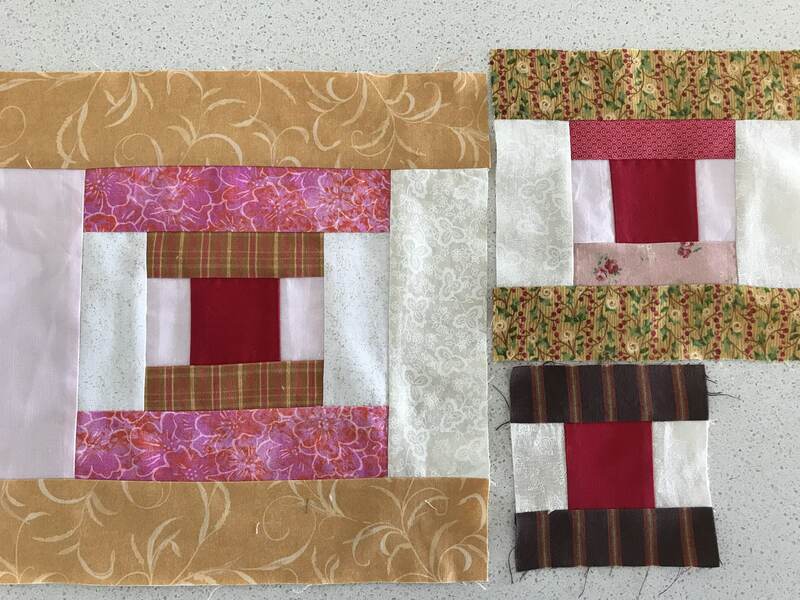 I will be using red centre blocks as I think for a baby quilt it will look great! Take the red centre square. 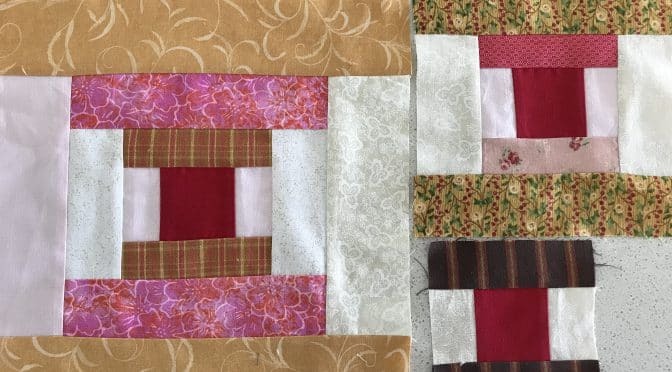 Sew the 1 1/2″ x 2 1/2″ strips to two opposite sides of the red square. Finger press the seams as you go. 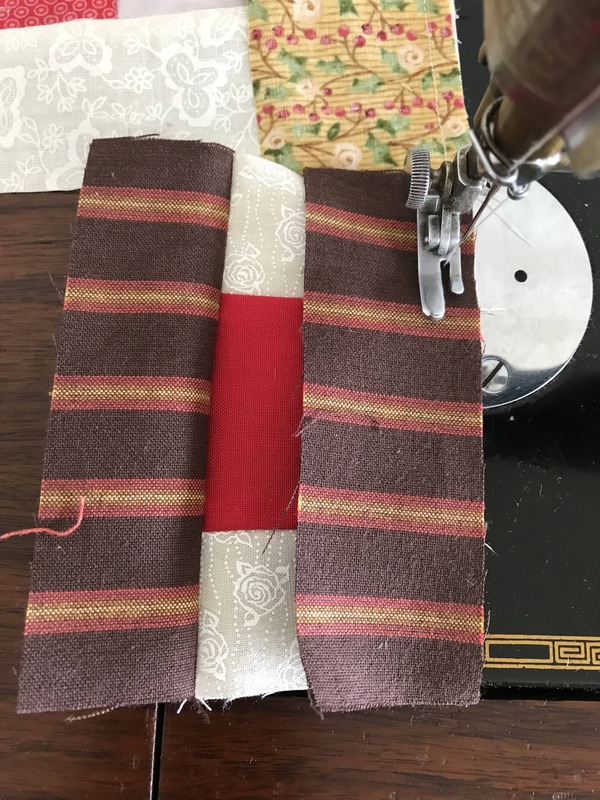 Now sew the two of 1 1/2″ x 5″ dark strips to the next two sides. Continue adding the strips in the same manner following the listed order and finger pressing ( or formal pressing) as you go. Only 13 pieces in each block so it’s pretty fast! Here are some of the blocks at various stages of construction. You may notice that all the strips are in commonly available sizes , so you should easily be able to use leftovers in your stash. Stay tuned for the quilt!